I am lucky enough to have been their conductor since 2007. I am also Artistic Director of Big Apple Performing Arts, the organization that oversees them, along with our sister ensemble, Youth Pride Chorus. NYCGMC welcomes El Coro Gay de la Ciudad de México in March 2017, 2 months after Trump's inauguration. Their spirit and their joy reminded us why we do what we do. 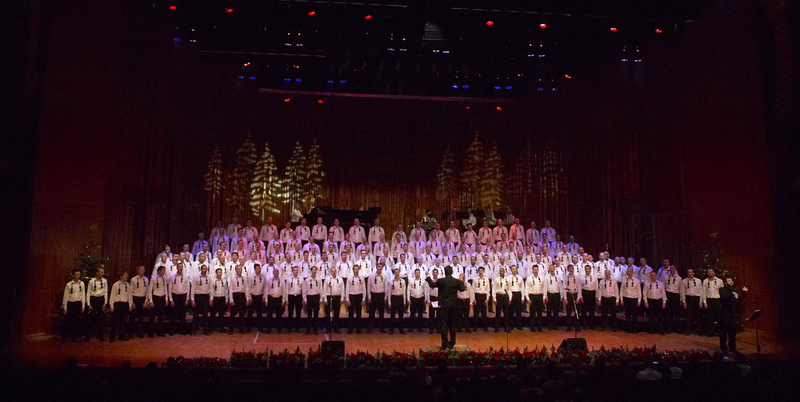 NYCGMC is comprised of 275 talented singers of various ages, backgrounds, and experiences. Together, we produce a vibrant sound and energy that audiences can feel and connect with. Through the technical quality and sheer power of this sound, and our spectacular performances, we are fearless champions for love, equality, and acceptance. Our reputation grows year on year. As you can see from the pictures below, we sing in a very wide variety of settings, and always seem to succeed in moving people, and raising the roof! New York City Pride 2017. We sing and dance in the March, and I appear on TV advocating for LGBTQ equality, in a flowery shirt. New York CIty Gay Men's Chorus, GALA Festival Opening Ceremony, July 2016 - we always sing with energy! New York CIty Gay Men's Chorus, Big Gay Sing 7 March 2014. It's hard to hate someone you just sang a song with! conducting a small but enthusiastic group at our annual September Singathon in Jackson Square Park in New York City. As Artistic Director, I conduct the main chorus in three main shows a year. These include a Holiday show in December, a 'Big Gay Sing' singalong show in March and a June show that raises awareness of LGBTQ issues. In recent years, these more compelling shows have covered crystal meth addiction, living with HIV, and the joys and sorrows of growing up and living life as an LGBTQ US citizen. In June 2014, we also hosted all of New York City's LGBTQ choruses at a choral celebration at the Cathedral of St John the Divine. Since 2007, NYCGMC has worked under my direction with artists of many styles. Our pop music work allows us to reach the widest audience. Most recently, this has included a 2014 Pride appearance singing 'Chandelier' with Sia and a 2013 dance music show featuring soul diva Martha Wash. We also have an on-going relationship with transgender singer-songwriter Our Lady J. and Idol runner-up Frenchie Davis. In New York, musical theater is an important way to connect with local audiences and other gay men. NYCGMC regularly works with many of Broadway's top vocal talents, including Carolee Carmello (Scandalous, Parade), Kelli O’Hara (South Pacific), Victoria Clarke (A Light in the Piazza), Chris Seiber (La Cage aux Folles, Spamalot), Fredi Walker-Browne (Rent) and Ann Harada (Avenue Q). NYCGMC prides itself on its stylistic diversity, and has also worked with gospel and soul singers Lillias White, Frenchie Davis and Michael McElroy (Broadway Inspirational Voices). We are also proud of our Connect program, a series of smaller projects which aims to engage with all corners of New York City. In recent years, two of NYCGMC's most exciting Connect program activities have been our 'SAGE Singalongs', singalongs at centers for older LGBTQ citizens, and our pioneering work with Diaspora Community Services. Here, we did what I call 'singing interventions' with women of color in Church Avenue, Brooklyn, where we combined singing songs they knew with small group discussion of feelings and issues around living with HIV. We sang with them, they sang with us, and we all learnt about HIV together. NYCGMC small groups also regularly sing at gay and straight weddings in the city and at political events, including the 2012 Annual State of the Borough Address by Scott Stringer, Borough President of Manhattan. The London Gay Men's Chorus in December 2006 at the Barbican Hall. in what now seems like a previous life (I look so young in that Sydney picture below! ), I was also Musical Director and conductor of the London Gay Men’s Chorus from 2002-2007. Under my leadership, the chorus grew from 120 to around 220 members. LGMC became the largest gay choir in Europe, on a par with the larger US LGBT choruses, increasing in size, musical excellence, fundraising need and both community and outreach ambition. They also performed to sell-out audiences in the top international venues in London every year, including the Queen Elizabeth Hall (2002, 2003, 2004, 2006) and Barbican Hall (2004, 2005, 2006). LGMC regularly worked internationally too - Sydney Opera House (2002), Kennedy Centre (2004), and Settembre Musica, Turin (2006). They were increasingly booked by the UK’s top promoters (Raymond Gubbay, Gordon Poole) and developed a deserved reputation for artistic innovation, vocal excellence and commercial success not only in the gay community but also in the highly competitive artistic community of London.